RAYNHAM, Mass. – The Canton boys hockey team rested its case on Thursday evening. The Bulldogs wrapped up an undefeated regular season, putting the finishing touches on their Super 8 résumé with an emphatic exclamation point: a 6-1 thumping of Coyle & Cassidy in the Joe Quinn Memorial tournament championship game. While the evidence seems to lie in favor of the Bulldogs, it will now be up to the jury, in this case the Super 8 committee, to decide if Canton (20-0-1) will reach the state’s Division 1A tournament for the first time in program history. “We did the best we could,” said Canton head coach Brian Shuman. Canton suffered its lone blemish — a tie — on Wednesday evening when it skated to a 2-2 tie against Boston Latin (14-3-3). The Bulldogs did, however, prevail in overtime which doesn’t count during the regular season but would factor in during the MIAA playoffs. The Bulldogs finish with 104 goals scored, averaging 4.9 goals per game while allowing just 20 goals on the season, less than one per game. With a chance to bounce back from the tie, Canton passed the test with flying colors. The Bulldogs dominated on both ends of the ice, taking a lead late in the first period, adding four goals in a lopsided second period, and tacking on one more in the third before sitting the majority of its top two lines for the final minutes. Canton controlled the entire first period, but it didn’t show on the scoreboard until just one minute left in the opening frame. The Bulldogs had a pair of power plays, killed off a penalty in-between, and racked up a 17-2 advantage in shots on goal. 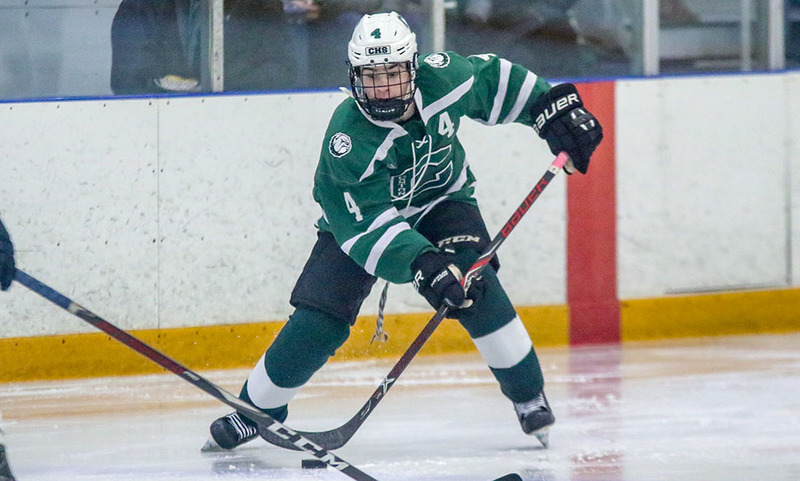 Midway through the period, freshman Eamon Kelly nearly opened the scoring when he redirected a blast from senior Tommy Dimock, but Coyle goalie Brett Borges made a positional save. A minute later, junior Johnny Hagan won the faceoff, stepped around a Coyle player and rang the corner of the crossbar. Off an offensive zone faceoff, Canton junior Ronan O’Mahoney fired a shot from the blue line that trickled past Borges. The puck was cleared off the line but only as far as defenseman Jack Connolly, who quickly tossed the puck back on net. The rebound fell right to Kelly and he tucked it right inside the post for a 1-0 lead. “The goal at the end of the first was huge,” Shuman said. “Coyle was playing with a lot of emotion, a lot of passion, they want to win it for their coach. They came out with a lot of energy so to get the goal late was huge. It was a great pass from Jack to Eamon, who had a great game. A freshman thrown onto the second line had a huge impact on this game with two goals, couldn’t be prouder. The momentum gained with the late goal in the first carried over to the second. Just one minute in, Hagan collected the puck along the boards and whipped a pass in front that senior Ryan Nolte redirected in for a quick 2-0 lead. Less than two minutes later, the Bulldogs continued to press, and a lengthy offensive zone possession ended with a wrist shot goal from senior Matt Martin to make it 3-0 with 12:20 to go in the second. Coyle got on the board with 7:56 left in the second, the puck deflecting from behind the net back out front and was batted in. But before Coyle could even think about cutting the deficit down further, Canton extended the lead back to three with a goal 30 seconds later. Nolte had his way with the Coyle defense but his shot was stopped. The rebound, however, bounced right out to Hagan all alone in front and he calmly placed his shot into the back of the net for a 4-1 lead. “That’s a big thing, you have to be able to push back after you score a goal, and you have to be able to push back once they score a goal, and we did that,” Shuman said. The onslaught carried through the period. Kelly grabbed his second of the game with 2:44 to go, collecting the puck in the left circle and firing a wrist shot that was partially saved but had enough mustard to beat the glove. Nolte put the cherry on top less than four minutes into the third period. The senior dangled around a defenseman, faked a shot at the near post and dragged it around Borges and tucked it in at the far post for a 6-1 lead. Canton boys hockey will learn its tournament fate when the tournament committee gathers in Franklin on Saturday morning.